Chic Alert: Give me a little Pout! If you're like me and so many other girls all over the world, you will have already fallen in love with Pout, the fabulously feminine, celebrity adored make-up brand from London. 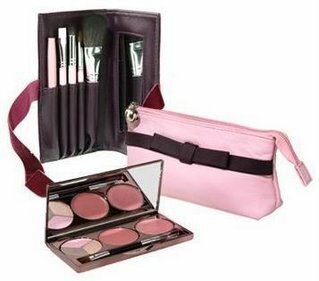 And today, in its continuing Christmas gift competition, Handbag.com is giving you the chance to win the fabulous, must-have Pout make-up bag and make-up pallete shown here and valued at £45. Simply click HERE for your chance to win this gorgeous Christmas gift and join the many celebs who 'Pout' including, Beyonce, J-Lo, Britney, Terri Hatcher, Gwyneth Paltrow, Kate Hudson, Naomi Watts, Sienna Miller, Kate Moss, Jennifer Aniston, Helena Christensen and Ashley Olsen. Did I miss anyone?